KANSAS CITY, KAN. ---- Billed as a Jayhawk Conference volleyball classic, the showdown between No. 4 ranked Johnson County and No. 5 Kansas City Kansas Community College was even better than advertised. Battling back from four consecutive match points, Coach Mary Bruno’s Lady Blue Devils rallied for a 19-17 in the fifth and deciding match played before a boisterous crowd of 200 in the KCKCC Field House Wednesday night. 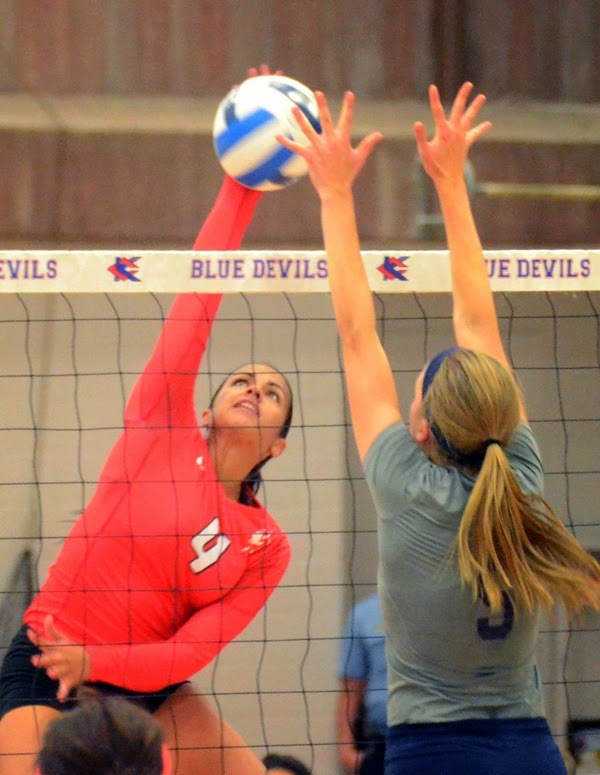 The win boosted KCKCC’s overall record to 16-3 and Jayhawk mark to 3-0 heading into home games against Southeast Nebraska Friday at 6 p.m. and Monday against Jayhawk rival Highland at 6:30 p.m. before another big conference showdown at Cowley County (5-0) on Wednesday. JCCC, meanwhile, fell to 12-5 and 3-1. Calling it the biggest kill of her career, sophomore co-captain Blair Russell slammed home the decisive 19th point before being mobbed by jubilant Blue Devil teammates. “I’m so happy; it was so exciting,” said Russell, a 5-10 outside hitter from Marysville, Kan. The win was made even more gratifying by the Lady Blue Devils refusal to fold under adverse situations. Deadlocked 13 times, neither team had led by more than two points in the decisive fifth set but JCCC was twice within a point of winning with a 14-12 lead on a kill by Kayla Dewey. However, a block by Kailee Dudley and a service ace by Russell got the Blue Devils even at 14-14. Two more times JCCC took the lead at 15-14 and 16-15 but each time the Blue Devils battled back to even and then went ahead 17-16 before absorbing what could have been a devastating knockout blow. Called for serving out of rotation, the Blue Devils were penalized a point that made it 17-17. “I think we got caught up in the emotion of everything,” said Bruno. But instead of folding, the Blue Devils took the next two points capped by Russell’s game-winner. KCKCC led all the way in taking a 25-22 opening win but fell behind 13-5 in the second, rallied to within a point before the Lady Cavaliers pulled away for a 25-18 decision. The Blue Devils again took early leads of 13-8 and 18-11 in the third set before hanging on for a 25-21 win but couldn’t prevent JCCC from a 25-19 fourth game win. Depth was critical in the win. In addition to Russell and Dudley, the Blue Devils got solid frontline help from sophs Lily Thornberg, Jasdel Gonzalez, Junelie Irizarry, Peyton Pender and freshman Allyssa Lutgen and great defense and sets from sophs Lily Cullers, Andrea Aparicio, Thornberg and freshman Kimberly Martinez.